Looking deeper at a healthier option for horses with exercise-induced pulmonary hemorrhage. Recently, in the Thoroughbred racehorse industry there has been some controversy over banning a medication called Furosemide. This medication, also called “Salix” or “Lasix,” is the common choice of treatment to reduce exercise induced pulmonary hemorrhage (EIPH). In the U.S., Lasix is currently the only medication legal to administer to a horse on the day of a race. Some experts claim that Lasix is also a stimulant, allowing horses to perform above their natural abilities. In an effort to improve the racing industry’s image and reduce the use of medications, the Kentucky Horse Racing Commission has recently backed a proposal to ban the use of Lasix on race day (1). Furosemide is a strong diuretic that causes the fluid in a horse’s body tissue to be released and then passed through the urine. The medication is used to reduce or prevent the condition of EIPH, which is when a horse bleeds from its lungs during intense exercise. 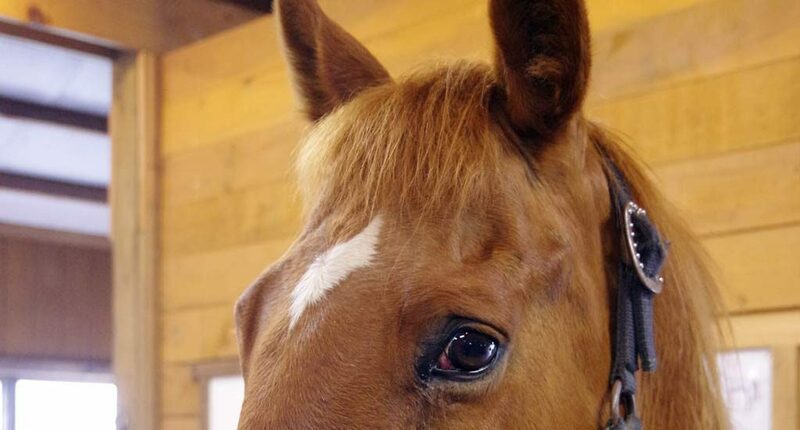 Horses with this condition are commonly called “bleeders,” and it can often become a lifelong and chronic condition. When a horse is given Lasix, it results in the loss of up to several gallons of fluid, which causes dehydration as well as weight loss. Some researchers have suggested that the weight loss is the actual reason for improved race times when a horse receives Lasix (2). Studies on the effects of Lasix have conflicting results on the medications ability to prevent bleeds. Artistic rendition of a horse’s lungs, showing the alveoli and capillaries that are affected by EIPH. Due to the lengthy legislative process, the proposed plan for gradually eliminating the use of Lasix will not begin until January 1, 2014. The regulation would only apply to racing Quarter Horses and Thoroughbreds, starting with the two-year-old graded and listed stakes. According to the proposed timeline, in 2015 it would apply to both two- and three-year-olds, then by 2016 the use of Lasix on race day would be banned for all horses racing in Kentucky (3). According to the current regulation proposal, if a horse is found to have Furosemide in its system then the horse is disqualified from the race and listed as unplaced. This means that all purse money would be forfeited. Additionally, the person responsible for administering the medication would be penalized with varying levels of fees and suspensions. At this point Kentucky is the only state to support the ban, but they hope that other states will begin to follow suit. Whether the ban is actually enacted still remains to be seen. Furosemide is already banned in many countries throughout the world (4 NY times), due to the fact that it is considered a performance enhancer and allows horses to race that might not be able to otherwise (5). Microcurrent therapy is an alternative method that has been used for years to avoid using Lasix and to successfully treat EIPH in race horses. Using microcurrent therapy (learn more link) is non-invasive and provides healing elements, making it a safer and healthier option for the horse. Unlike Lasix, the microcurrent Lung Treatment has been reported to actually help heal the horse’s lungs, which can provide longer-lasting results. Additionally, there are no bans on the use of microcurrent therapy. The Lung Treatment method has been reported to be consistently reliable, whereas studies on the effects of Lasix have provided varying results. The microcurrent treatment greatly improves the horse’s comfort levels, and pre-race checks with an endoscope have showed previous bleeders to have clear lungs. Ideally, once a horse is diagnosed with EIPH or suspected to have it, the horse would be treated three days in a row with the microcurrent Lung Treatment prior to a race. The protocol for this treatment can be found in the book MicroCurrent for Horses, by Deborah Powell.